They say that you are only as old as you feel. Many of us will feel the same as we did 10, 20 or even 30+ years ago. Wouldn't it be nice if the mirror reflected the same? Non surgical facial treatments can help to reduce wrinkles, restore facial volume and improve overall skin condition giving a relaxed and rejuvenated appearance. We are all unique and individual and one size very much does not fit all. It is important before we begin we fully assess your individual concerns and treatment aspirations. We can then advise on the best treatment course. All treatments are carried out by either Donald or Gillian. Treatment with Botulinum toxin is the most popular non surgical facial treatment provided worldwide. Excessive contraction and activity of the muscle of facial expression can lead to the formation of wrinkles, especially in the forehead and around the eyes (Crows feet). Botulinum toxin (BTX) blocks the release of the substance (acetylcholine) responsible for nerve impulses which cause muscle contraction. By injecting BTX into the affected area the muscles responsible for wrinkling become less active, effectively going into hibernation, giving the face a more relaxed and refreshed appearance. The wrinkles become smoother or may even disappear altogether. When and how long does BTX work? Initial effects can be felt within 48-72 hours with the maximum effect reached in about 1-2 weeks. For some people however it may take up to 20 days. A review appointment will be arranged for 2-3 weeks after treatment. The effect of treatment generally lasts 3-4months. Re-treatment is then required. If you decide to stop treatment, any permanent lines and wrinkles will gradually return. Is the treatment safe? What are the potential side effects? 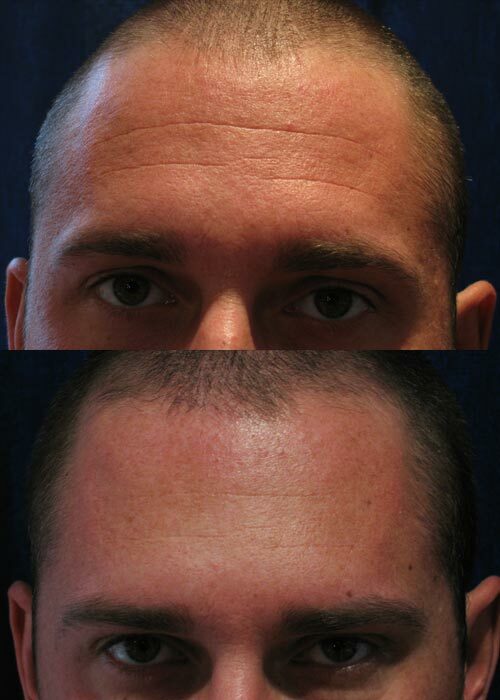 BTX is the most widely used non surgical procedure worldwide and is generally safe. Certain side effects can occur but like the intended treatment effects they are reversible. The most common side effect is bruising or swelling at the injection site. Other effects can include, slight feeling of nausea, headaches, itching, dry eyes, brief visual disturbances. 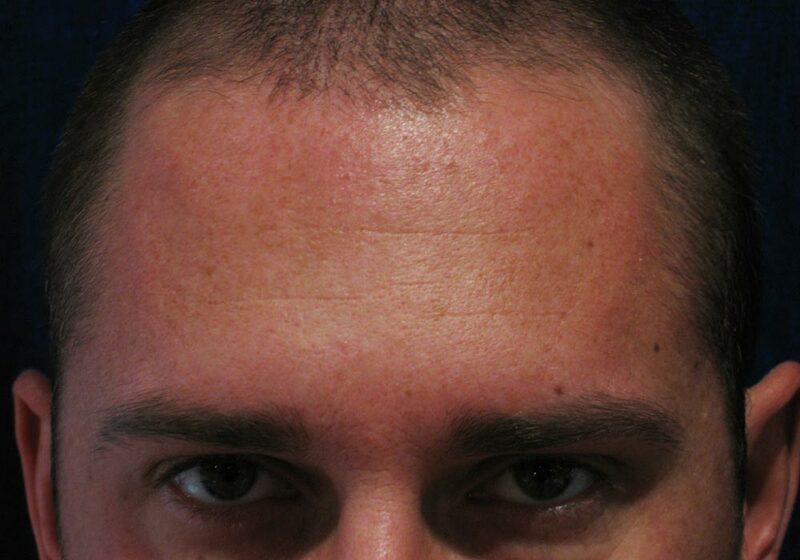 In a small percentage of cases there may be temporary drooping of the eyebrow or upper eyelid. Although very distressing this is reversible though may take a few weeks to resolve. 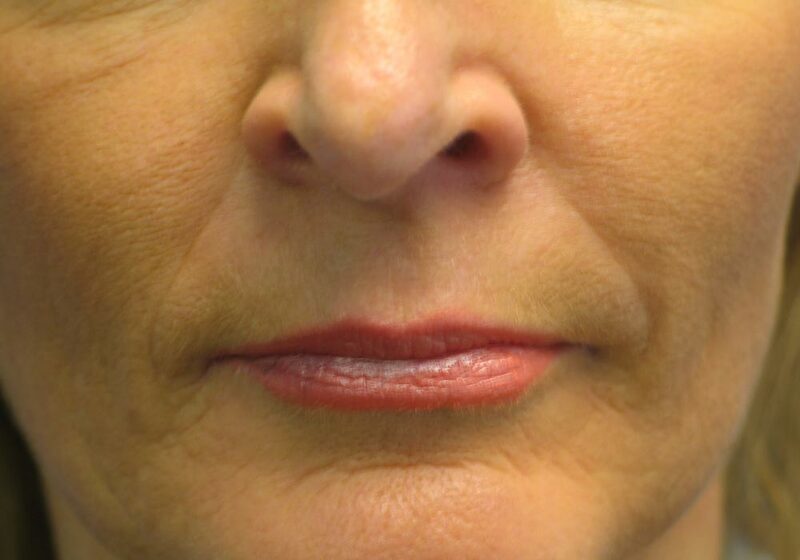 After a consultation you will be asked to make various facial movements (frowning, smiling, lifting the eyebrows). This will assess your individual muscle movements and determine where the BTX will be administered. This will be done using very fine needles are under the skin. Some people may be aware of a slight stinging sensation during this process. Photographs will also be taken. These form part of your treatment record will not be shown to anyone without your consent. No. Certain medical conditions are a contraindication to treatment. These include Myasthenia gravis, Lambert-Easton syndrome and blood coagulation disorders. Drug interactions can occur if BTX is used concomitantly with other medications, especially, amino glycoside antibiotics, anaesthetics and muscle relaxants. Will BTX remove all lines and wrinkles? Unfortunately not! 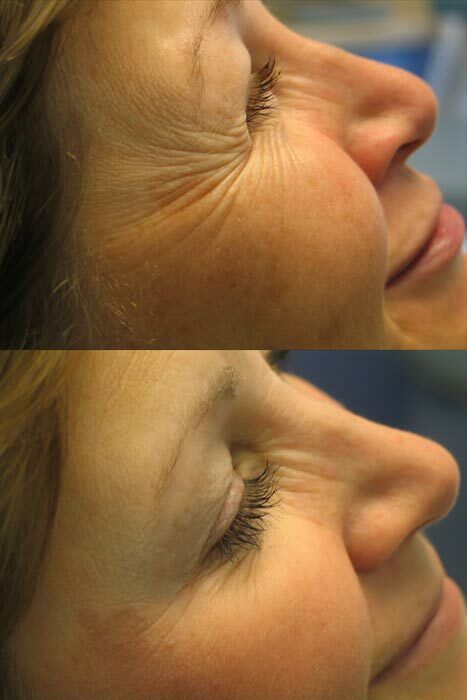 Deep set wrinkles that have been present for many years will be softened but will not completely disappear. The elasticity and quality of your skin will also determine the achievable result. 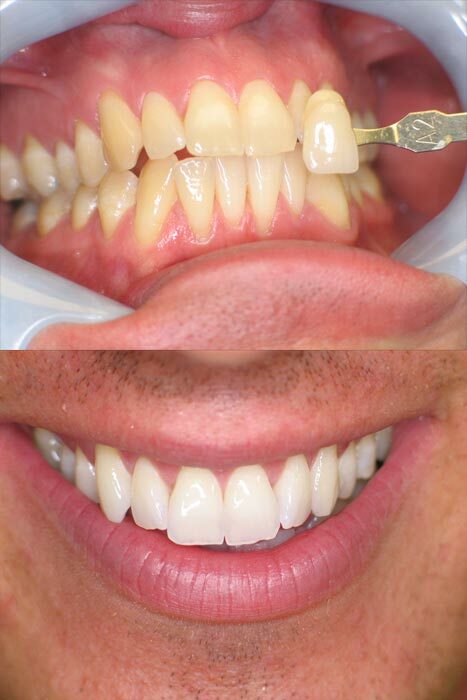 Remember though that a 100% wrinkle free appearance does not always produce a natural looking result. Complete eradication of movement can lead to a frozen appearance. 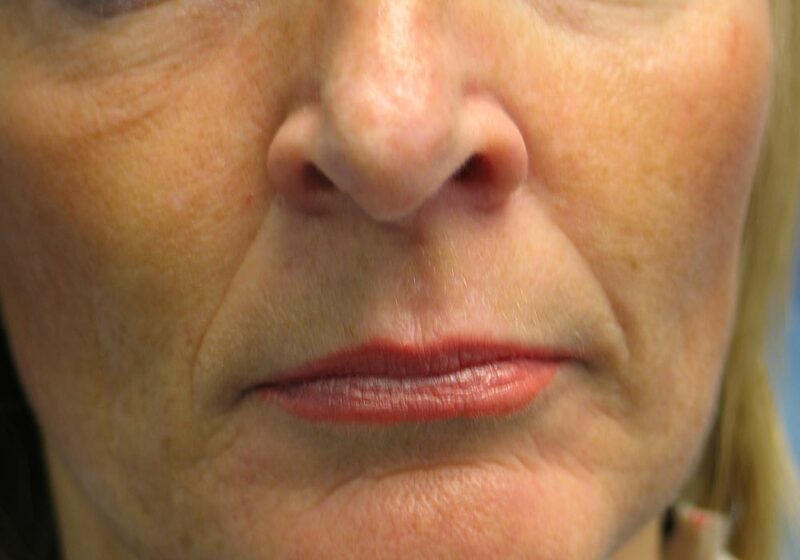 Treatment will reduce the appearance of existing lines however if you do not currently have visible lines treatment will also delay the appearance of these. Many people are now opting to have BTX as a preventive treatment. Remember though that a good skin care regime is also essential to prevent photo-aging effects. 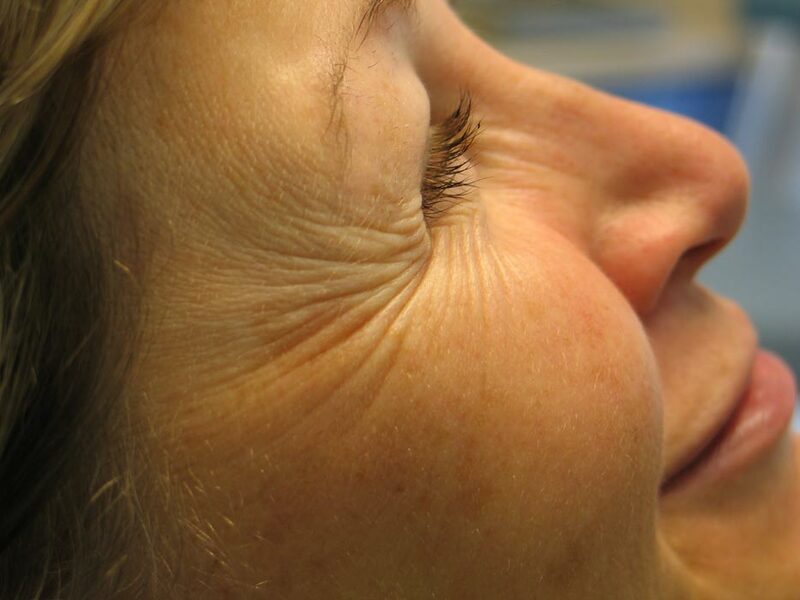 Will I get more wrinkles if I do not continue with treatment? The effects of BTX are temporary. As these wear off muscle movement will gradually return to before treatment levels and your existing wrinkles will return. Severe underarm sweating is a medical condition that involves overactive sweat glands. Although clinical strength anti- perspirants are available in some cases these are not strong enough. Clothes can become an issue as the wrong choice of fabric can all too easily reveal excessive sweating. Treatment with BTX can help. Small injections underneath the arm temporarily block the nerves that stimulate sweating. It will not stop all sweating as the body still needs to perspire. The aim of treatment is to bring the individual sweat rate down to normal levels. Most individuals report a dramatic reduction in sweating levels (up to 80%) that lasts on average 4-8 months. The first stage is to ascertain where the excessive sweat is being produced. This is done by performing a starch-iodine test. This involves covering the underarm area with a surgical iodine solution and then dusting the area with starch. This reveals the areas of sweat. 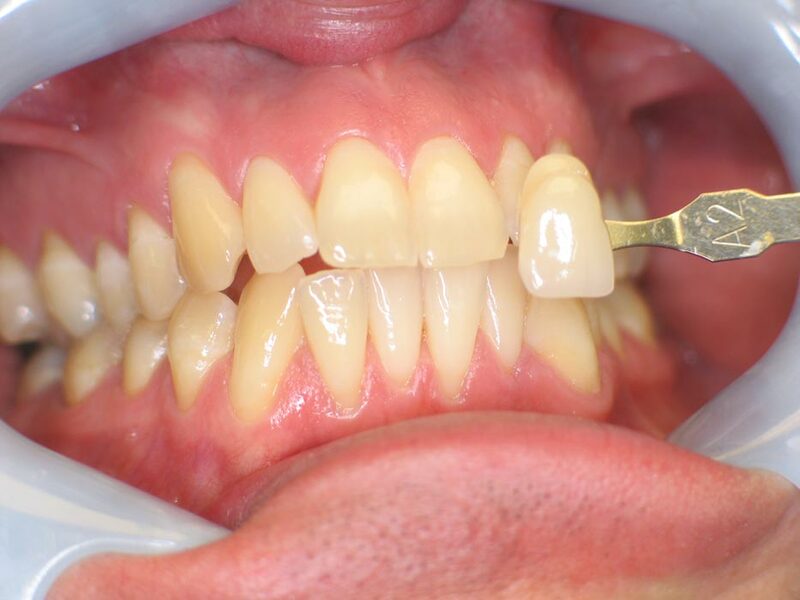 Small injections are then placed within these areas. Total treatment time is approximately 30 minutes. It is important that your armpits are shaved and that you refrain from using deodorant/ anti-perspirant for 24 hours prior to your appointment. It is also important to wear suitable clothing for your appointment i.e. a sleeveless top or vest in order to allow unobstructed access to the underarm area. Any sleeved clothing will have to be removed prior to treatment. 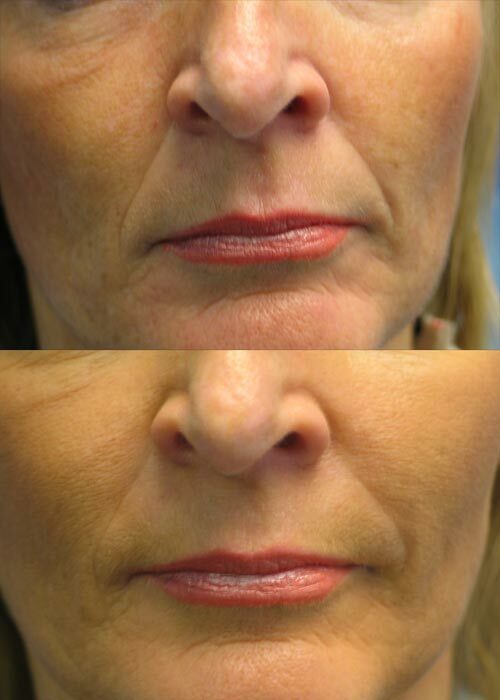 Dermal fillers are designed to restore volume, soften lines and enhance shape. One of the main constituents of the skin is hyaluronic acid (HA). HA is responsible for skin hydration. It has an amazing ability to hold up to 1000 times its weight with water which helps it maintain skin smoothness and volume. As we become older the HA in our skin becomes less efficient which leads to loss of volume. Fillers are composed of stabilized HA therefore when we inject these into the skin we are effectively giving our own HA a helping hand, helping it to restore volume and lift the skin to smooth away and soften the appearance of facial lines. It is a non animal product and patch testing is not required. RESTYLANE has the added advantages of stimulating collagen production and improving skin elasticity. Which areas are most commonly treated? 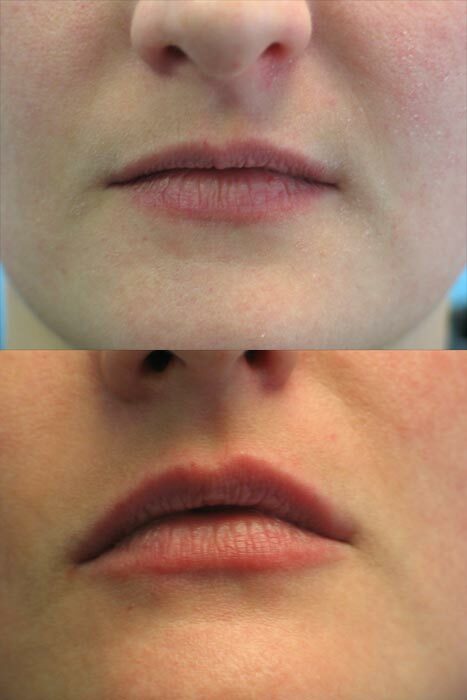 Fillers are used most commonly to smooth nose to mouth lines and to enhance the lips. Are the injections painful? How long does it take? An anaesthetic cream is applied to the skin prior to treatment so that it can be delivered painlessly. 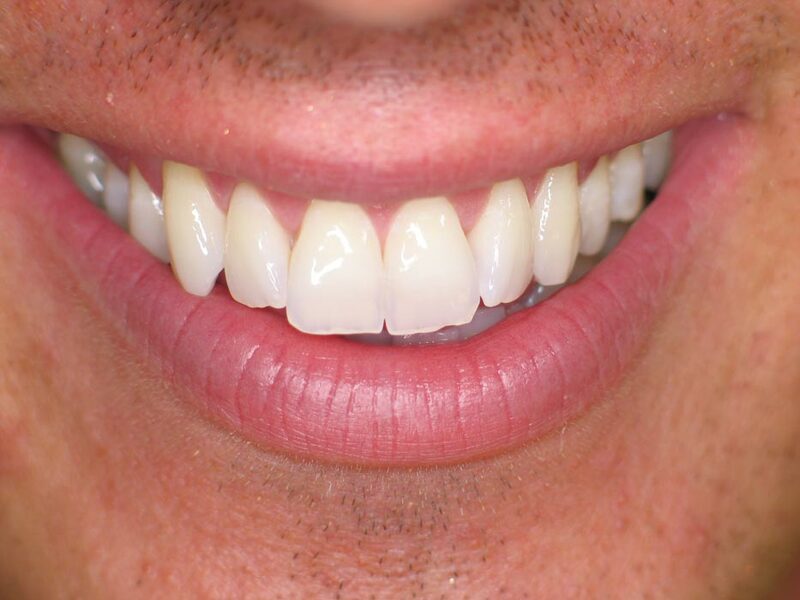 Anaesthesia is also given prior to any lip treatment to ensure the procedure is as comfortable as possible. After anaesthesia is achieved treatment generally takes 10-20 minutes. How long does it take for the treatment work? Results are instantaneous however there may be initial swelling or redness. Bruising can also occur at the injection site. The treated area may also feel tender or itchy. What can I do to help my skin recover quickly? Any initial reactions are temporary and resolve within 7-14 days. As with treatment with BTX you should plan carefully the timing of any treatment if you want to look your best for a particular date. 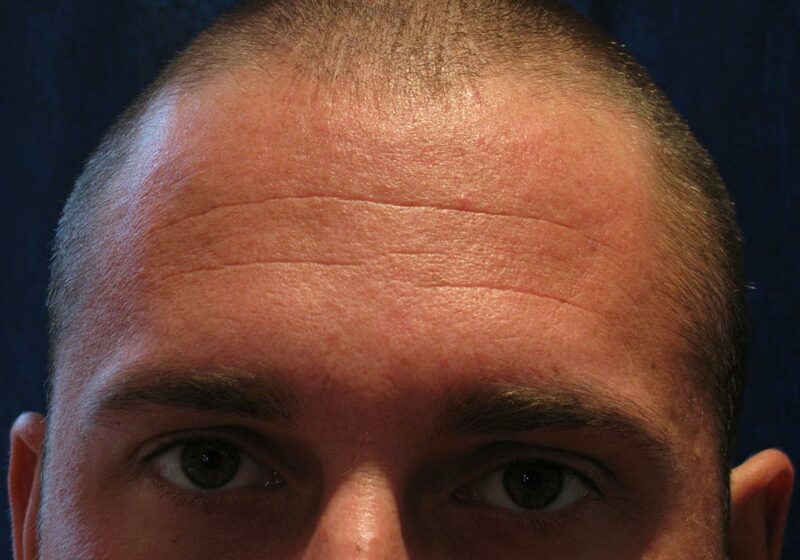 Facial lines generally show improvement for 9-12 months. 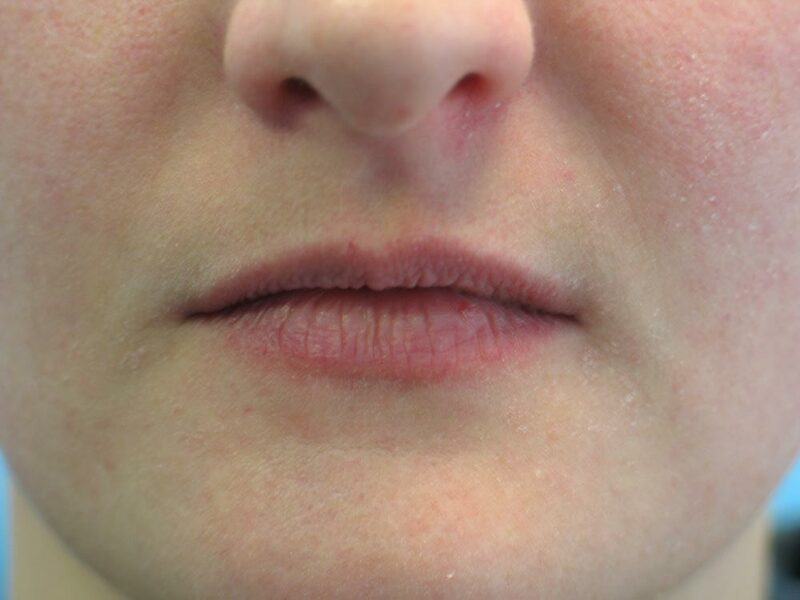 Lip enhancement generally lasts for 6 months. Will my lines be worse if I do not have a repeat treatment? A chemical peel is a wounding chemical which is applied to the skin to remove layers of skin with the objective of generating new, healthier skin as a natural consequence of the healing process. Various strengths of peel can be used. Light peels can reduce age spots and rough skin and slightly diminish fine lines. They have the advantage of no down time. Your skin instantly feels rejuvenated and make up can be applied immediately after the procedure if desired. Our Skinceuticals Light Peel revitalises sensitive skin and helps improve the appearance of problematic skin. It is also suitable for use on ethnic skins. It exfoliates the skin while decongesting pores and reducing irritation. It improves collagen synthesis and remodels existing collagen. A course of 6 peels is recommended for maximum results. Patch testing is required and it is essential that the appropriate homecare regime is followed for at least 2 weeks prior to treatment and throughout. Gillian will advise on the appropriate antioxidant for your skin type. Yes. Peels should not be carried out if you have undergone radiation treatment or chemotherapy in the preceding 6-12 months, are using Roaccutane or retinoic acid products or have done within the last 6 months, have an active outbreak of Rosacea, acne or herpes simplex, are pregnant or breast feeding, have an allergy to aspirin or are not prepared to use the recommended products prior to and during treatment. Founded in 1997 by dermatologists, SkinCeuticals discover, develop, and deliver innovative dermatology products that improve the overall health and appearance of the skin, using pure, pharmaceutical grade ingredients with proven scientific results. SkinCeuticals are market leaders in Vitamin C technology and were the first to develop a topical Vitamin C product using L-Ascorbic acid which has been proven to stimulate collagen, neutralize free radicals and is also an anti-inflammatory. Sun exposure is the most common cause of free radical formation. UVA rays cause aging, while UVB rays cause burning.UVA rays are 100 times more plentiful than UVB rays and are present all year and can penetrate, clouds, clothes and windows and also penetrate 30-40 times deeper into the skin. So what can we do to prevent and protect our skin from free radicals and minimize the damage they cause? Everyone's skin can benefit from a preventive sunscreen and antioxidant regime and prevention lies at the heart of any further corrective programme. A good preventive programme can have corrective benefits and can therefore enhance the effects of a corrective programme. The most important thing that anyone can do for their skin?